A long-grain rice that is approximately four times longer than it is wide. Basmati is one of the most popular long-grain rice varieties due to its texture, nutty flavor, and popcorn-like aroma. Much of the basmati rice is cultivated in India and Pakistan. The rice is fluffy and dry and the grains do not stick together after it is cooked. 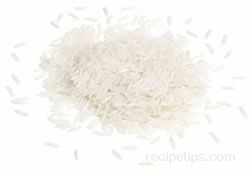 Steaming, boiling, and baking are excellent preparation methods for basmati rice, which can be used in pilafs, salads, and a variety of cooked dishes. Basmati rice combines well with sauces and curries. It is readily available in most large food stores.